Neither Wolf Law, LLC, nor Jeffrey Wolf support or encourage drinking and driving. Please be responsible and use a designated driver or call a cab. One night, you’re out having a few drinks with friends. At the night’s end, you “feel fine,” are only “buzzed,” or you “don’t want to leave your car” and decide to drive instead of calling a cab. Half-way home, red and blue flashing lights engulf your rear-view mirror. You’re sitting on the side of the road, watching the officer walk up in your car’s side view mirror. Your heart is pounding through your chest, but it’s important to keep calm. Knowing what the police might ask, and having your responses ready, is the best way to prepare for this situation. 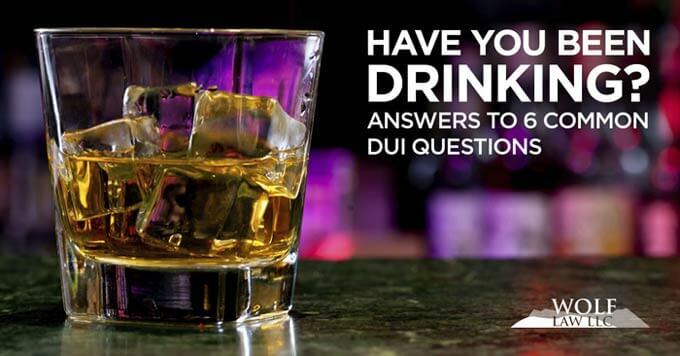 Here are six questions the officer might ask if they suspect you’ve been drinking. Remember, how you handle yourself in this situation can determine if you’re heading home or being charged with a DUI. At this point, you are being charged with a DUI. Colorado’s Express Consent Law requires any driver to consent to a chemical test (breath or blood) if an officer has established probable cause that you are driving under the influence. You do not get to decide if he has established probable cause – that is up to a court and the DMV at a later date. Refusing to cooperate with a chemical test will result in a lengthy suspension of your driving privilege and a mandatory interlock device in your car. Complying with the request is your best option, though the decision of which test to take is a personal one (and each has its own implications). Breath results are quick and get the ball rolling much quicker on actions taken against your driving privilege by the DMV. With a positive breath test, you only have 7 days to request a hearing or your driving privilege will be immediately suspended. Blood results can take months to come in and can give some breathing room on driving privilege actions by the DMV but are more intrusive as they require a blood draw.